Introduction: Total elbow arthroplasty (TEA) is an established treatment for late-stage arthritis of the elbow. In comminuted distal humerus fractures, there is a role in performing total elbow arthroplasty to aid in the restoration of function and range of motion. This is a case series describing TEA in 3 non-rheumatoid patients who sustained comminuted distal humerus fractures. Methods: Three elderly non-rheumatoid patients who sustained comminuted distal humerus fractures underwent total elbow arthroplasty using Zimmer® Coonrad/morrey prosthesis. Demographic data was retrospectively collected and outcomes were measured using the mayo elbow performance scores. Results: Post-operatively, the patients demonstrated improvement in mayo elbow performance scores and were able to return to functional activities in their daily lives. Conclusion: TEA is a viable option for non-rheumatoid elderly patients who sustain comminuted distal humerus fractures due to a low energy fall, with satisfactory outcome measures. The elbow is a complex joint with a critical role in upper extremity function. Mobility and stability of the elbow joint are important for daily, leisure, and professional activities. Even minor trauma or transient disease involvement can result in limited and painful elbow motion. There is a greying tsunami amongst developed countries as birth rates fall and life expectancy increases. With the improvement of healthcare over the past few decades, the elderly population are increasingly looking to more active lifestyles and their expectations in social and daily activities increase. Therefore, when they experience low-energy falls, they expect surgical intervention to be able to restore some of their function. Lowenergy trauma in non-rheumatoid elderly patients can result in comminuted distal humerus fractures. Traditionally, they have been managed with open reduction and internal fixation. With the advances in implant design, total elbow arthroplasty has become one of the available surgical options in patients with osteoarthritis or comminuted intra-articular fractures for pain relief and improvement in elbow motion . This is a case series which looks at three patients who underwent total elbow arthroplasty after they sustained a lowenergy trauma and resulted in comminuted distal humerus fractures. Since the first commercial TEA was introduced by Dee 2 in 1972, different implant designs have been introduced [2-5] TEA implants have two designs, of which one is linked and the other unlinked. The linked design consists of a hinge to connect the humeral to the ulnar component. Earlier linked designs consist of a fixed hinge that did not allow any varusvalgus motion between the humeral and ulnar components [3,6]. This resulted in high failure rates due to transmission of high stresses toward the implant cement–bone interface, leading to periprosthetic loosening and mechanical failure [1,4]. An improvement to the linked design was developed, which has a sloppy hinge that allows varus-valgus motion between the components [6-8]. The unique feature of the unlinked design is that it consists of a humeral and an ulnar component that are not mechanically linked, therefore it relies on matching shapes of the bearing surfaces, adequate bone stock, and soft tissue support for stability [9-13] Because of this, when the fracture is too comminuted, there is a higher risk of subluxation and joint dislocation when the unlinked design is used [1,10]. The unlinked and linked design with sloppy hinge have both been used for decades, but whether one design is better than the other is uncertain [14,15]. The linked and the unlinked designs are represented by different implant brands provided by different product companies . As with the implant design, whether any implant brand is superior to others is uncertain [11,14-16]. We conducted an institutionalized review board approved retrospective study of three patients who sustained comminuted distal humerus fractures from low-energy fall and were subsequently admitted into our institution from May 2014 to March 2016. The inclusion criteria were more than 70 years old, absence of other fractures on the upper limbs, and only in individuals with low strenuous activity. Exclusion criteria were rheumatoid arthritis, ulnar or median nerve palsy, prior elbow surgery, overlying skin infections or erythema of the elbow, presence of open fracture and the presence of elbow contracture. These patients underwent total elbow arthroplasty during their inpatient stay under a single fellowship-trained surgeon using the semi-constrained Zimmer® Coonrad/morrey total elbow prosthesis. This involved a cemented humeral component and a press fit ulnar component. Patients were placed supine on the operating table with a sandbag under the scapula. A direct midline posterior elbow skin incision was made longitudinally. The fascia was dissected until the ulnar nerve was encountered and it was then carefully freed from the surrounding tissues with a pair of dissecting scissors and translocate anteriorly and protected with vessel loops throughout the whole procedure. The medial aspect of the triceps was then retracted along with the posterior capsule. The triceps is then removed from the proximal ulnar by the release of Sharpey’s fibres from their insertion. Other aspects of the extensor mechanism such as the anconeus is further reflected laterally, allowing complete exposure of the distal humerus, proximal ulnar and the radial head. The extensor mechanism is then moved to sublux the triceps laterally. Olecrenon osteotomy is performed with the oscillating saw and the medial and lateral collateral ligaments are released surgically from their humeral head attachment. The elbow is then subsequently flexed to separate the distal articulation from the humerus. The forearm is rotated externally so as to allow further flexion and separate the articulation. The next step is the humeral resection, whereby the mid-portion of the trochlea is removed with a saw. The medullary canal of the humerus is then allowed access. The burr is used to remove cortical bone from roof of olecranon fossa with a burr and rongeur. The Awl reamer is then used for entry into the medullary canal. After ensuring that the medial and lateral aspects of the supracondylar columns are identified as landmarks, the humeral alignment guide is used to perform manual reaming of the medullary canal. The humeral alignment guide is then placed properly and the distal humerus is sawed with an oscillating saw. Care is taken to preserve the supracondylar column to avoid causing a stress riser. A rasper is then used to complete the preparation of the humeral canal. Next surgical preparation is the preparation of the ulnar. Some subchondral bone at the base of the coronoid is removed with the help of a high-speed burr. A starter awl is then introduced into the ulnar medullary canal and it is subsequently prepared further with the rasp. After completing the preparation of the ulnar, the trial prosthesis is then placed into the humeral and ulnar canals, the joint is reduced and the range of motion noted. The trial prosthesis is then removed and the canals irrigated with pulse lavage in preparation for cementation. When the actual prosthesis is inserted, it is vital that the axis of rotation of the prosthesis be at the same level as the normal anatomic axis of rotation. The tourniquet is subsequently deflated and a size 12F or size 14F drain is placed. The triceps is repaired to its original position with sutures with the elbow flexed at 90 degrees. The ulnar nerve is protected by placing it in a subcutaneous pocket. Patients were provided with an arm-sling postoperatively, and the upper limb is monitored with neurovascular charting. The drains were removed on post-operative day 1 and there were no incidences of post-operative seroma or haematoma. Patients were followed up for wound healing, range of motion, and outcomes were measured using the Mayo Elbow performance score. We had three elderly non-rhuematoid patients, (77 ± 4.4) years old, (Table 1) all of whom were male, who sustained comminuted distal humerus fractures (Figures 1 and 2). These patients had multiple comorbidities (Table 2). They were admitted into our institution and underwent total elbow arthroplasty under a single specialist surgeon using the Zimmer® Coonrad/morrey total elbow arthroplasty implant (Figures 3 and 4) via the posterior triceps-sparing approach. Post-operatively they were assessed using the Mayo Elbow performance score (78.3 ± 5.7). Patient 1 Atrial fibrillation has pacemaker and on warfarin, Lung carcinoma, Benign prostatic hypertrophy, Previous myocardial infarction. Patient 2 Hypertension, Hyperlipidemia, Obstructive Sleep Apnoea. Patient 3 Ischemic Heart Disease, Diabetes Mellitus, Hypertension, Hyperlipidemia. Figure 1: AP radiograph of left humerus fracture. Figure 2: Lateral radiograph of left humerus fracture. Figure 3: AP radiograph of coonrad-morrey total elbow arthroplasty. 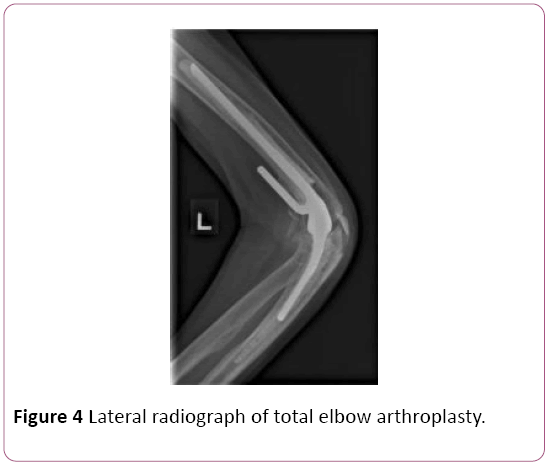 Figure 4: Lateral radiograph of total elbow arthroplasty. Post-operative rehabilitation was similar for all the patients as they underwent physiotherapy at our institution. They were immobilized in an arm-sling for first two weeks, and the subsequent four weeks they were allowed gentle range of motion. Restriction of carrying objects not more than 500 grams was advised for the first three months. There were no wound complications and no infections. The patients did not report any numbness of the limb postoperatively. Drains were removed after two post-operative days and no complications of seroma, no erythema of wounds occurred. After post-operative follow-up of around two months, they were able to achieve functional range of motion (80 ± 8.6 degrees). Globally, the issue of a grey tsunami is going to plaque many developed countries. With an increase in life expectancy, there are more elderly patients and they aim to lead fulfilling lives in their evening years. Associated with the increasing life expectancy is the alarming rise in the number of elderly patients who sustain fractures. A fracture of the distal humerus in elderly, non-rheumatoid patients may result in severe comminution. It is challenging to manage patients with displaced intra-articular, comminuted distal humerus fractures. They are usually managed operatively because nonoperative management would result in significant functional impairment such as stiffness, chronic pain and even nerve palsies . The gold standard of surgical management is open reduction and internal fixation using bicolumnar humeral plate osteosynthesis [18,19]. However, even this method of surgical fixation is technically challenging and fraught with high complication rates of hardware failure, malunion, nonunion, stiffness of the elbow and ulnar neuropathy. This study showed that total elbow arthroplasty is a viable option for elderly, non-rheumatoid patients who sustain comminuted distal humerus fractures. The post-operative function tests and post-operative range of motion is acceptable and patients reported good satisfaction and demonstrated good results. Unlinked prostheses have also been used to treat fractures of the distal humerus, although additional column fixation may be needed to achieve satisfactory stability of the humeral implant . One study in Liverpool involved nine patients treated with unlinked elbow prostheses and they concluded that at least one column of the distal humerus must be preserved for it to be used . In conclusion, the management of distal humerus fractures in non-rheumatoid elderly patients remains a controversial topic. Advances in plate design and availability of locking screws allow many more fracture patterns of distal humerus fractures to be fixed compared to the past. However, rigid internal fixation may not always be achievable especially if there is severe comminution and poor bone quality. The results of this study indicate that TEA is an appropriate and acceptable treatment method for patients who sustained distal humerus comminuted fractures due to low energy falls. Voloshin I, Schippert DW, Kakar S, Kaye EK, Morrey BF (2011) Complications of total elbow replacement: A systematic review. J Shoulder Elbow Surg 20(1): 158-168. Bernardino S (2010) Total elbow arthroplasty: History, current concepts, and future. Clin Rheumatol 29(11): 1217-1221. Dee R (1972) Total replacement arthroplasty of the elbow for rheumatoid arthritis. J Bone Joint Surg Br 54(1): 88-95. Sanchez-Sotelo J (2011) Total elbow arthroplasty. Open Orthop 5: 115-123. Souter WA (1990) Surgery of the rheumatoid elbow. Ann Rheum Dis 49(2): 871-882. Dee R (1982) Reconstructive surgery following total elbow endoprosthesis. Clin Orthop Relat Res 170: 196-203. Morrey BF, Bryan RS (1982) Complications of total elbow arthroplasty. Clin Orthop Relat Res 170: 204-212. Gill DRJ, Morrey BF (1998) The Coonrad-Morrey total elbow arthroplasty in patients who have rheumatoid arthritis: A ten to fifteen-year follow-up study. J Bone Joint Surg Am 80(9): 1327-1335. Espag MP, Back DL, Clark DI, Lunn PG (2003) Early results of the Souter-Strathclyde unlinked total elbow arthroplasty in patients with osteoarthritis. J Bone Joint Surg Br 85(3): 351-353. Giannicola G, Sacchetti FM, Antonietti G, Piccioli A, Postacchini R, et al. (2013) Radial head, radiocapitellar and total elbow arthroplasties: A review of recent literature. Injury 45(2): 428-436. Jenkins PJ, Watts AC, Norwood T, Duckworth AD, Rymaszewski LA, et al. (2013) Total elbow replacement: outcome of 1,146 arthroplasties from the Scottish Arthroplasty Project. Acta Orthop 84(2): 119-123. Van der Lugt JC, Rozing PM (2004) Systematic review of primary total elbow prostheses used for the rheumatoid elbow. Clin Rheumatol 23(4): 291-298. Potter D, Claydon P, Stanley D (2003) Total elbow replacement using the Kudo. J Bone Joint Surg Br 85: 354-357. Fevang BTS, Lie SA, Havelin LI, Skredderstuen A, Furnes O (2009) Results after 562 total elbow replacements: A report from the Norwegian Arthroplasty Register. J Shoulder Elbow Surg 18(3): 449-456. Skytta ET, Eskelinen A, Paavolainen P, Ikavalko M, Remes V (2009) Total elbow arthroplasty in rheumatoid arthritis. Acta Orthop 80(4): 472-427. Park SE, Kim JY, Cho SW, Rhee SK, Kwon SY (2013) Complications and revision rate compared by type of total elbow arthroplasty. J Shoulder Elbow Surg 22(8): 1-7. Robinson CM, Hill RM, Jacobs N, Dall G, Court-Brown CM (2003) Adult distal humeral metaphyseal fractures: Epidemiology and results of treatment. J Orthop Trauma 17(1): 38-47. Shin SJ, Sohn HS, Do NH (2010) A clinical comparison of two different double plating methods for intraarticular distal humerus fractures. J Shoulder Elbow Surg 19(1): 2-9. Zalavras CG, Vercillo MT, Jun BJ, Otarodifard K, Itamura JM, et al. (2011) Biomechanical evaluation of parallel versus orthogonal plate fixation of intra-articular distal humerus fractures. J Shoulder Elbow Surg 20(1): 12-20. 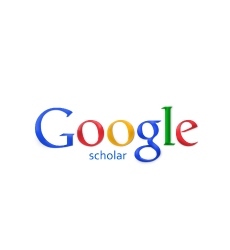 IkÃÂ¤valko M, Lehto MU (2001) Fractured rheumatoid elbow: Treatment with Souter elbow arthroplasty-a clinical and radiologic midterm follow-up study. J Shoulder Elbow Surg 10(3): 256-259. Kalogrianitis S, Sinopidis C, El-Meligy M, Rawal A, Frostick SP (2008) Unlinked elbow arthroplasty as primary treatment for fractures of the distal humerus. J Shoulder Elbow Surg 17(2): 287-292.